According to wikipedia Thesaurus: “Is a book that lists words grouped together according to similarity of meaning (containing synonyms and sometimes antonyms), in contrast to a dictionary, which contains definitions and pronunciations”. 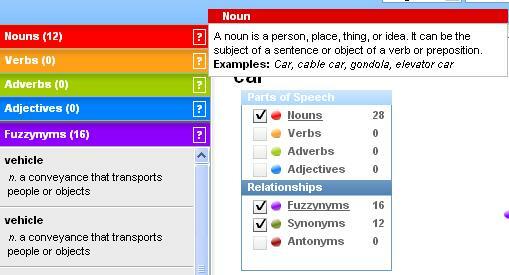 Thesaurus is based on “Term relationships” which are links between terms. These relationships can be divided into three types: hierarchical, equivalency or associative. Hierarchical relationships are used to indicate terms which are narrower and broader in scope. A “Broader Term” is a more general term e.g. “Apparatus” is a generalization of “Computers”. Reciprocally, a “Narrower Term” is a more specific term e.g. “Digital Computer” is a specialization of “Computer”. The equivalency relationship is used primarily to connect synonyms and near-synonyms. Associative relationships are used to connect two related terms whose relationship is neither hierarchical nor equivalent. This relationship is described by the indicator “Related Term”. In a way, associative relationships should be applied with caution, since excessive use of RTs will reduce specificity in searches. 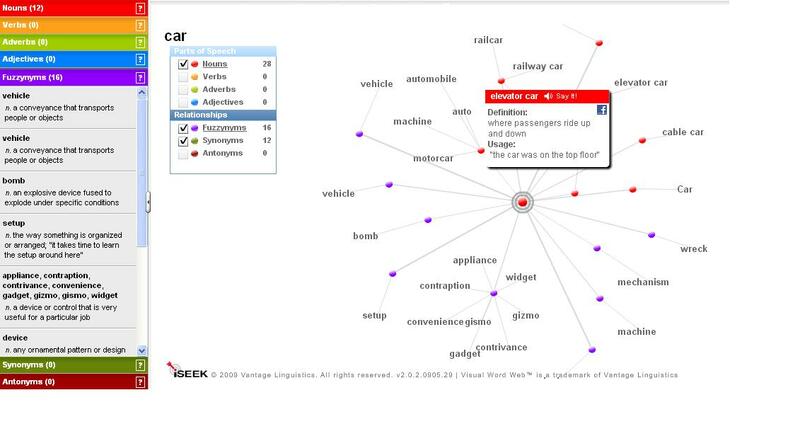 The Visual Thesaurus of the Cambridge Dictionary Online is an example of a Thesaurus. 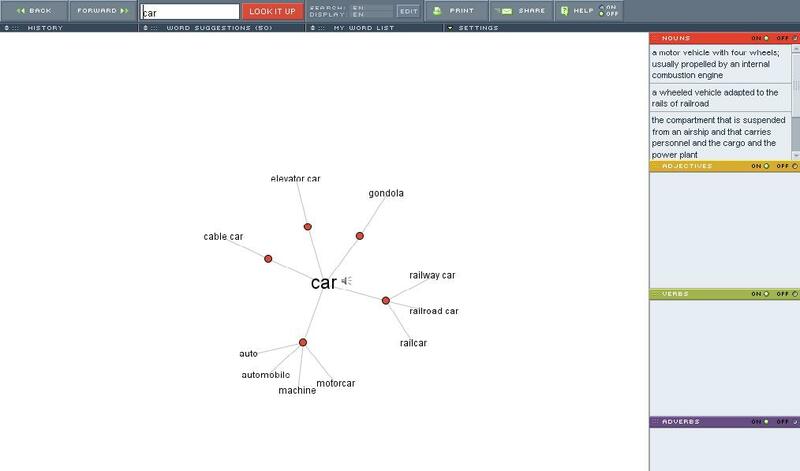 In the website, when you look up a word in a selected topic, you can see other entries in that topic on the right-hand side – a group of words that are related to the word you looked up. The words in the cloud are bigger or smaller depending on how frequently they are used. 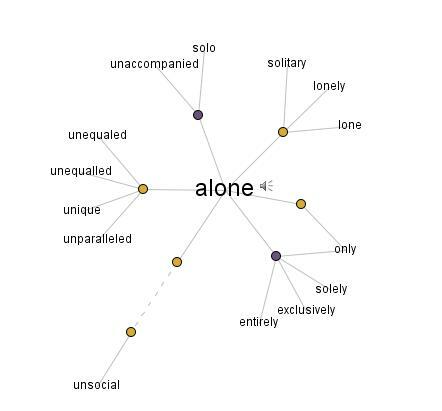 Here we have an example with the word alone. With a slight click in that square, the website leads us to the Visual Thesaurus. Then, we type in a word (alone) and clicking once again we can find a big thesaurus in the middle of the page. The yellow points indicate adjectives and the blue points adverbs. Then, we have red points which indicate nouns and the green ones which indicate verbs. The last two doesn’t appear in the example. Moreover, we are given the sound of the word searched, we can hear the pronunciation of words just with clicking the loudspeaker. If you are interested in this ingenious tool here you have more information: The largest thesaurus in the world, the Historical Thesaurus of the Oxford English Dictionary , which contains more than 920,000 words and meanings. In this section of my review, I would like to compare both The Visual Thesaurus of CDO and Lexipedia. 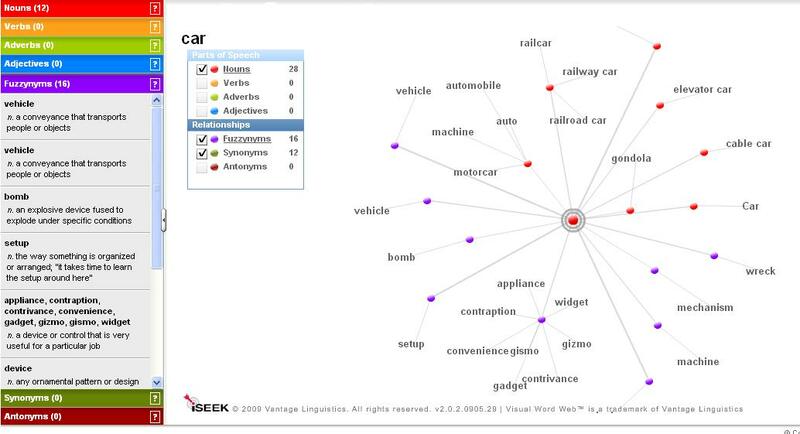 Lexipedia is another page with thesaurus that is very similar to Visual Thesaurus. However, they have little differences among them. At first sight as many other thesaurus they looked equal, both show nouns, adjectives, verbs… What’s more, they also show the definition and the sound of each word we have looked up. Apart from that, they have the chance of search a word in other languages which is useful for people who are learning more than one language. However, apart from equalities, we can also find little differences. First, you just need to type in the word you are interested in and, then, click were it says “look it up”. After that, you do not need to do anything else, the word just shows a number of words related to what you have searched. As well as in the other thesaurus you have to type in the word you are interested in and, then, click were it says “sumit”. Instantly, as well as in the other example, a thesaurus appears with a number of words related to what you have searched. At first sight, we can appreciate that Lexipedia looks more elaborated and easier than CDO’s Visual Thesaurus as it has very well organised elements. In the case of CDO’s Visual Thesaurus, the page which appears in front of us when we look up a word is rather boring and simple as it has just the meanings of words on the right and the thesaurus in the centre. Another difference between these thesaurus is that Lexipedia gives us the meaning of words such as noun, adjective, verb etc and Visual Thesaurus don’t. The last but also an important difference is that in Lexipedia, just putting the mouse in any word of the thesaurus a window appears with the sound and definition. In the case of CDO’s Visual Thesaurus you have to click on the word to make the sound appear. What’s more, Lexipedia offers the definitions of words on the left of the page and also in the window I mentioned before.